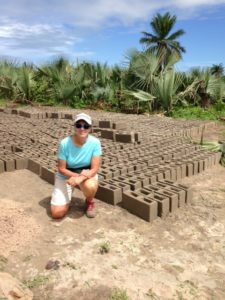 Dr Carla Chieffo, President of Paoli-Malvern-Berwyn (PMB) Rotary Club and Penn Vet alumnus, visited The Gambia Goat Dairy (GGD) project in The Gambia Africa this summer. 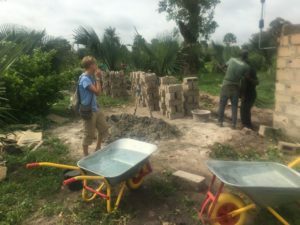 GGD is an ambitious project, launched 2 years ago by what can only be described as a fortunate coincidence between Power up Gambia’s Director, Lynn McConville and Dr Carla Chieffo. 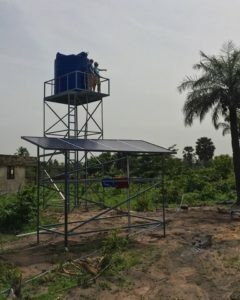 McConville introduced Kebba Badgie, CEO of Sulayman Junkung General Hospital (SJGH) with the idea of creating a goat dairy in rural Gambia to Chieffo at a Rotary meeting. Chieffo, in turn, enlisted the help of Dr. David Galligan, Professor of Animal Health Economics at Penn Vet to co-mentor the project. 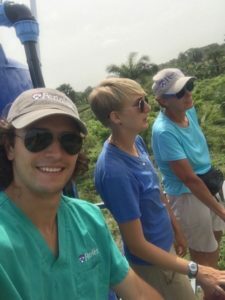 Together, they selected Brianna Parsons, who graduated from Penn Vet in May and is now pursuing an internship at New Bolton Center and Corey Spies now a fourth-year veterinary student. Spies and Parsons had spent 2016 and 2017 working on developing their business plan, building relationships with stakeholders, and identifying a suitable site for the dairy. They chose 10 acres located in the Kombo region along Gambia’s small Atlantic coastline. Now in year three of its venture, the GGD is breaking ground for construction. “The progress this summer is amazing” said Dr Chieffo. 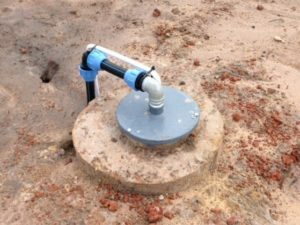 The construction of a borehole, which will provide water to the farm, was finished. It is completely solar powered with a capacity to provide the future dairy with 30,000 Liters of water each day. Having water available has also allowed GGD to begin construction of a perimeter wall that will keep goats in. GGD has also hired a local Gambian that lives on the property as a watchman. Dr Chieffo also had an opportunity to meet with the Fajara Rotary Club in The Gambia. They are interested in supporting the project and are looking forward to working with PMB Rotary to obtain a global grant. The Penn Community has also taken an interest in this project. Penn provides two Penn Global Internships each year for students who want to work on the GGD project. Briana Wilson, a second-year veterinary student at Penn and Madeline McGovern, a senior majoring in engineering, also at Penn, were selected this year and are working with Parsons and Spies this summer. This project hopes to create a commercial-scale, sustainable herd of milking goats. The aim of the dairy is to model best practices while supplying local residents with affordable and safe dairy products. In Gambia, the smallest country in Africa, owning livestock is commonplace. However, these animals are on average 30 times less productive than their counterparts in more-developed nations. As a result, the country relies heavily on expensive, imported animal products like milk and yogurt. A quarter of the children under five are stunted from a lack of adequate nutrition. For the GGD, the first phase is to get the facility up and running with 50 or more milking does (female goats). The second phase will involve educational outreach to other goat farmers in the area. The third phase for the non-profit business will be shifting roles from producer to processor, creating a dairy market from the ground up for domestic farmers. The dairy will have a pasteurizer on-site to ensure the milk is safe to drink. Milk will be sold to local families at a low cost, subsidized by the sale of higher-value goat cheese and yogurt to tourists who frequent the region. “The whole goal is to be financially self-sustaining. Another major goal is to make a difference in the nutritional status of the people who live near the dairy. 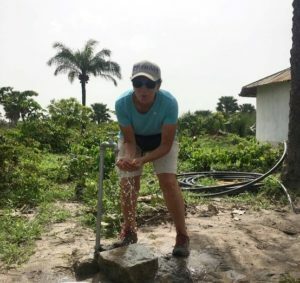 Working with government agencies in Gambia, the dairy team is hoping to obtain information about the nutritional status of local residents, so they can measure their impact and assess if the dairy and their outreach efforts have made a difference in reducing malnourishment. This project was supported though Penn Vet, Penn’s Global Internship Program and through Rotary grants. The finished borehole! Completely solar powered with capacity to provide the future dairy with 30,000 L of water each day.GGD Advisor Dr. Carla Chieffo’s first sip of this Corey Spies, Dr Brianna Parsons and fresh, clean water! Dr Carla Chieffo discuss next steps. Dr Brianna Parsons oversees perimeter wall construction. Dr Carla Chieffo on site. 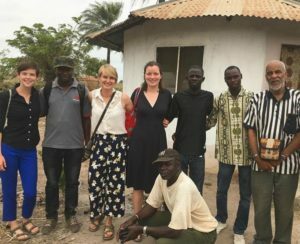 Bri Wilson (far left), Dr Brianna Parsons (third from left), and Madeline McGovern meet with members of the Village Development Committee of Sanyang, where the dairy will be located.